* Note: There is no telecast of Airlines on 18th January 2015 as Star Guild Awards 2015 takes its time slot. Kunal wears a mask to hide his identity and enters Ananya’s home and tries to attack her but runs from there after Shefali found an intruder presence. Later, Ananya asks Shefali to relax and speaks of missing her since she will be going to Queen’s college of Music. Shefali thanks Rohit and Ananya for her admission and also speaks that Kunal has credited Ananya for the help. Ananya learns that Shefali likes Kunal. Shefali informs her of Kunal not saying anything and then reminds Ananya on her feelings for Aakash. Ananya recollects the moment with Aakash when he greeted formally instead of informal hug. She informs Shefali that she doesn’t have anything with Aakash and also there is no need to speak about it. Moreover, thinks that Aakash doesn’t have feelings for her but shefali thinks otherwise. Ananya evades more questions and goes to sleep. Next morning, Ananya greets Shefali and attends a call and informs of coming in 40 minutes. Shefali packs Ananya’s bag and even puts the diary in it. Aakash at his end meets his senior boss who asks him about the diary. Aakash says that the diary will be found and informs his boss that currently the diary is with Ananya. He shows his boss a diary replica and informs that Ananya will give that replica diary to Megha instead of the real one. Meanwhile, Kunal comes to Ananya’s home and meets Shefali and asks about Ananya. He informs her of going to Airport and thought to get dropped by Ananya. Soon, Megha comes there and wants to meet Ananya as well to collect her diary. She is informed about Ananya gone to the airport and will be having a photoshoot. Shefali informs her of putting the diary in Ananya’s bag the same morning. Kunal learns it and wants to follow Ananya who has left for the airport. He gets a call and informs the caller of finding the diary with Ananya. Ananya attends an interview with the magazine and gets a call. Aakash is also travelling to reach the airport. Ananya’s photoshoot goes on at the airport and she gives many poses and captain Rathod sees her and shows some displeasure. Kunal also reaches the airport and the media lady Jyoti asks Ananya whether any male pilot has tried to flirt with her given the fact she is beautiful and young. Ananya recollects some distasteful comment by captain Karan. She comes back in present and suggests that with positive attitude nothing can affect her. The interviewer asks the last question whether she has fallen in love with someone. After some thoughts, she replies yes and suggests that in life we all fall in love once. Ananya feels emotional sooner after. After a while, Rathod meets Ananya and makes a taunt at her since he saw her doing a photoshoot and giving different poses. Ananya was leaving to take the flight and Aakash also comes there and signals his intelligence team member to interrupt Ananya by hitting at her bag. Ananya falls down and the diary falls on the ground. Aakash replaces the real diary with his own diary and hands over the real one to his team member. He greets Ananya and she asks about him and shows her concern. She also speaks of contacting him after he arrived from Goa but he speaks of being busy and also informs her that Natasha went to Singapore to attend her sister’s marriage. Aakash leaves and Kunal comes to meet Ananya. He speaks of coming there to collect the diary for Megha. She gives him the diary and he leaves. An old passenger at the check-in desk speaks of being a first time passenger and wants to reach Srinagar to meet his family. He is informed that Inde Airlines pilots and service are very good and is also informed about Ananya Rawat as the co-pilot of the flight. He speaks of knowing her as he has seen Ananya on TV and knowing her brave stories. Ananya comes in the cockpit and Rathod makes taunts on her make-up. Ananya recollects the moments she shared with Aakash a while back. The old passenger shows worry to enter the plane. Rathod continues to behave rudely with Ananya and also does the announcement and doesn’t let Ananya to do the same. The old passenger is helped by other young passenger and he shares his fears as he is flying for the first time. Kunal at his end gives the diary to his boss and soon learns that it is fake. He informs Aakash was there and his boss suggests that the diary is with Aakash. Meanwhile, Aakash’s senior boss is trying to get data from Mahima’s special diary which has a micro chip, video and voice recorder. Aakash comes there and the staff member dealing with data and systems informs them that the microchip got corrupted but he has recovered the data. Aakash sees the recording and finds a NRI David kapoor who lives in Chicago and frequently travels with Inde Airlines. He has told Mahima to keep an eye on David as he was having suspicion on him. There is a man standing behind David and Aakash speaks of seeing that man somewhere and ponders. Ananya at his end is informed there is a message for her from Jyoti Singh – the media lady who wants to complete the interview with her. Ananya requests Rathod whether she can go. He acts rude again and asks her to go since she can work in modeling if not flying planes. Ananya is about to go and Rathod thinks he doesn’t need her help and asks the airhostess to take Ananya’s seat. Ananya meets Jyoti who wants some pics. Ananya meets passengers while Jyoti’s cameraman takes her photos and she even meets the old man who wonders how come she is there. Jyoti wants some pic of Ananya in the cockpit but she declines. Ananya comes to the cockpit and Rathod makes more taunts at her and calls her as Miss Universe. 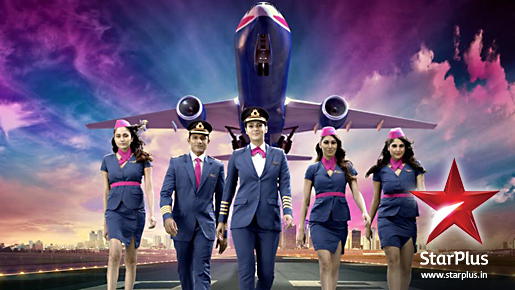 Jyoti calls the airhostess Shruti and asks her to inform Rathod that she wants to come in the cockpit. Rathod goes ahead to bring Shruti and cameraman in the cockpit. Ananya reminds Rathod that he is breaking the rules but he justifies himself by saying that Jyoti has written permission. They take his photos and he gets engrossed in photos and begins talking with cameraman and what follows after is the plane starts descending and all the warning signals gets activated. Rathod manages to manage the plane after some time and brings it to steady state. Ananya looks at him and he makes an announcement that because of weather they faced some problem but now things are fine and they will land in 20 mins at Srinagar airport. The old man is dead after going through plane’s immediate descend. Aakash at his end learns that David kapoor came to India six months ago at Kochi and he came for the first time to India. Aakash’s senior boss wonders why he went to kochi since he wanted to go to Goa moments later. He also travelled to different cities in India after staying in Goa and even have stayed there for 1-2 days in each city. The common element is Inde Airlines and Aakash thinks it might be the co-incidence and wonders what is the connection of David with Inde Air and project id 2877. The plane lands in Srinagar and Rathod comes to know of old man’s death and Ananya remembers the old man’s words asking her who is flying the plane when she came to take photos with passengers. Jyoti – the media lady thinks now she has got a full story – drama and negligence. At Aakash’s end, his senior boss informs him on finding a new lead that David Kapoor was working on a documentary on Inde Airlines. He got invitation by Vijay Mafatlal – owner of Inde Airlines and the father of Rohit Mafatlal. Aakash thinks what’s strange since David came for the documentary and his senior boss informs there is no documentary found or related evidence. Aakash learns from his staff member who did a search of Vijay Mafatlal with project ID 2877 that Vijay Mafatlal have 7 cars whose registration number is 2877 and even his landline phone no ends with 2877. Vijay used to stay in New South Wales, Australia and the area post code was 2877 as well. He then informs of a small village Talala in Junagadh province of Gujarat and its STD code is 7827. Aakash wonders what is the connection between Junagadh and Vijay Mafatlal. His staff member informs that Vijay was born and brought up in Junagadh and also he has started his business on 2nd August 1977 – 2877. Aakash wants to meet Vijay and his senior boss informs that is is very difficult to meet Vijay Mafatlal since he doesn’t meet friends or business partners, media or staff. According to sources, Vijay is ill but still he is a big fish and asks Aakash to be careful when meeting him. Vijay mafatlal is seen at a secluded home and some food was brought for him by a lady. He wants to go from there since he is kept there in exile. The lady wants him to relax otherwise she will give him few electric shocks. He shows his helplessness and agrees to listen to her. She also informs him a doctor will be coming to see him and he has to act normal. At Ananya’s end in Srinagar, the media asks her about the photoshoot in plane. Rathod speaks that Ananya was so much awe of the photoshoot and acted as a model. She speaks of unexpected turbulence and the media speaks of an old man death and wants an answer from her. The old man’s daughter comes and calls Ananya as a murderer. She suggests it was not an accident but a murder and holds Ananya responsible. She informs Ananya that God is watching and she will need to give an answer. Aakash at his end learns about the death in Ananya’s flight which landed in Srinagar. At Vijay’s home, the doctor who has tried to kill Aakash in Goa comes there. He gives an injection to Mafatlal and cites about his urgency. Will Rathod realize his own guilt instead of putting blame on Ananya for old passenger’s death ? Next week: Aakash wants to know about Dr. Awasthi who was treating Vijay Mafatlal. He also learns that Awasti’s family have reported to the police that he is missing since few hours. Aakash directs his staff member to circulate Awasthi’s photo in all police stations. Aakash thinks Dr. Awasthi will give him a definite lead about Vijay mafatlal.